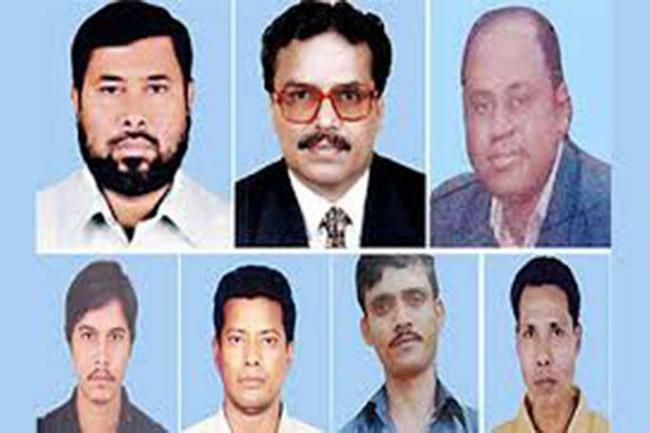 The High Court on Monday revealed the full text of the judgment on the sensational Narayanganj seven-murder case. In its full verdict, the HC stated that a ‘strong message’ is required to check brutal crimes such as this one and to ensure that such crimes are not committed by anyone else. The HC also described the crime as of “extreme brutality”. The HC released the full text of verdict more than a year after it passed the judgement, upholding death sentences of 15 convicts, including main accused Noor Hossain, dismissed RAB officials Lt Col Tareque Sayeed Mohammad, Maj Arif Hossain and Lt Commander SM Masud Rana. The 1,564 page text of the verdict was released after Justice Bhabani Prasad Singha and Justice Mustafa Zaman Islam, the two judges of the bench, which passed the order, signed on it. The full text was posted on the website of the Supreme Court. The High Court on August 22, 2017, pronounced the judgment in the two cases lodged over the gruesome murders. The other eleven convicts, whose death sentences were upheld, are Habildar Md Emdadul Haque, Md Arif Hossain, Lance Naik Hira Miah, Lance Naik Belal Hossain, Sepoy Abu Taiyab Ali, Constable Md Shihab Uddin, SI Purnendu Bala, Sepoy Abdul Alim, Sepoy Mohiuddin Munshi, Sepoy Al Amin and Sepoy Tajul Islam. The court, however, commuted death sentence handed down to another 11 people by the trial court, to life imprisonment. Narayanganj District and Sessions Judge court on January 16, 2017, sentenced 26 persons, including main accused Noor Hossain, dismissed RAB officials Lt Col Tareque Sayeed Mohammad, Maj Arif Hossain and Lt Commander SM Masud Rana, to death in the sensational seven-murder case. The court also sentenced nine other accused to different terms in jail. All the documents of the case were sent to the High Court on January 22. The High Court on February 8 received the appeals of the convicts. Twenty convicts including Noor Hossain, Tareque Sayeed, Arif Hossain, SM Masud Rana, Md Emdadul Haque, Belal Hossain, Abu Taiyab, Shihab Uddin and Mortaza Zaman Charchil filed the appeals against their sentences. Narayanganj City Corporation councilor Nazrul Islam along with his three companions and driver were kidnapped by a team of Rapid Action Battalion (RAB)-11 on April 27 in 2014. Besides, senior lawyer Chandan Sarker and his driver Ibrahim were also picked up by the same team as they witnessed the abduction of Nazrul and his associates. Subsequently bodies of all seven of them were found floating in the Shitalakkhya river. Two cases were filed in this connection — one by Nazrul’s family and the other by Chandan’s family.